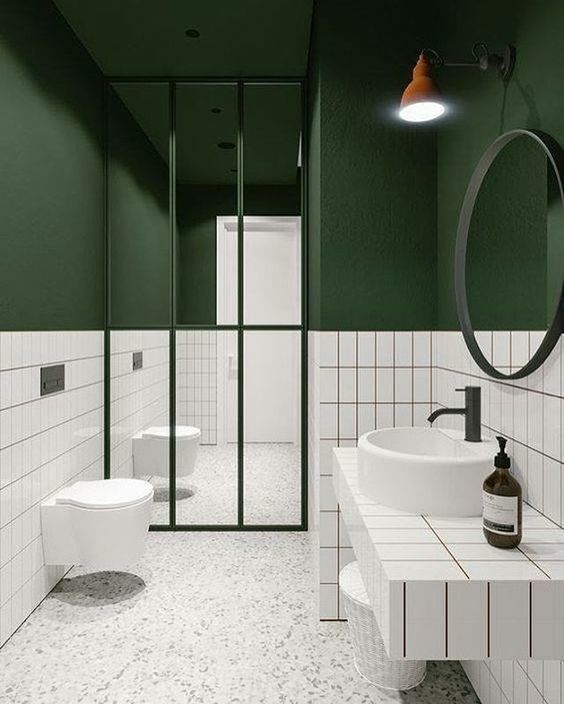 While modern styled room usually goes with more neutral color, these bathroom presents interesting look with their green painted wall. Although it’s all green, the clean and smooth lines are so minimalist and brilliantly interesting. 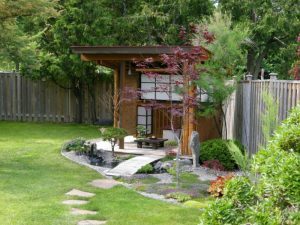 If you love green color and want to have more modern rooms, the combination seen in the bathrooms below might give you some fantastic ideas to start with. 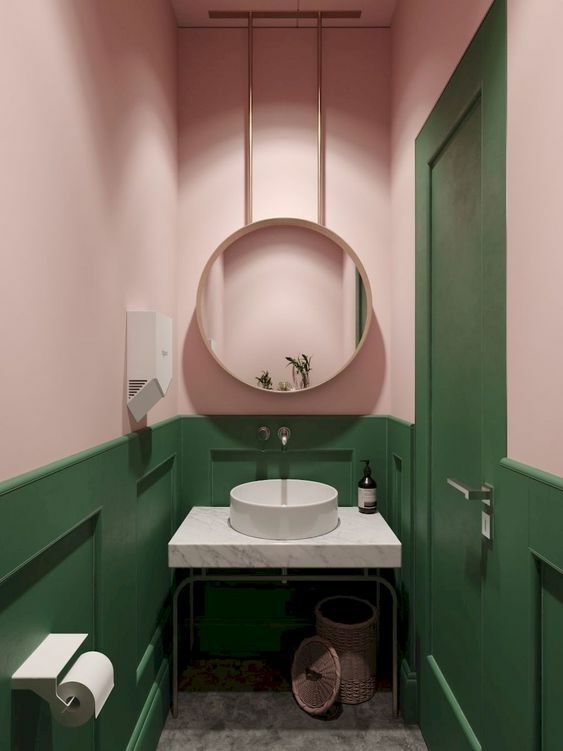 This bathroom shows a modern bathroom with mossy green painted wall combined with pink wall tiles on the backsplash and shower area. 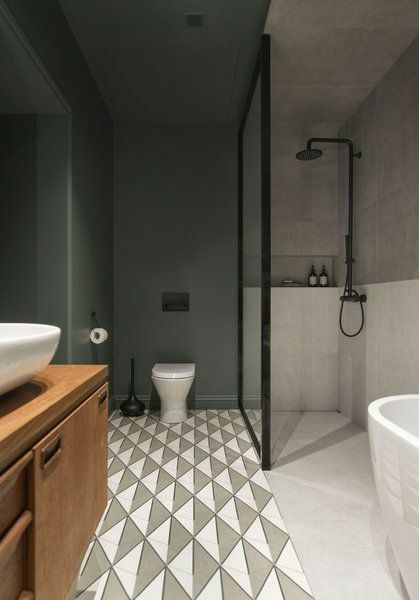 The geometric floor tiles gives stronger modern vibe to the bathroom. It balances the calm that the green wall brings in. This one is similar to the previous one with its pink and green color scheme. However, this one here puts the combination on vertical stack with pink painted wall and green wainscoting at the bottom. 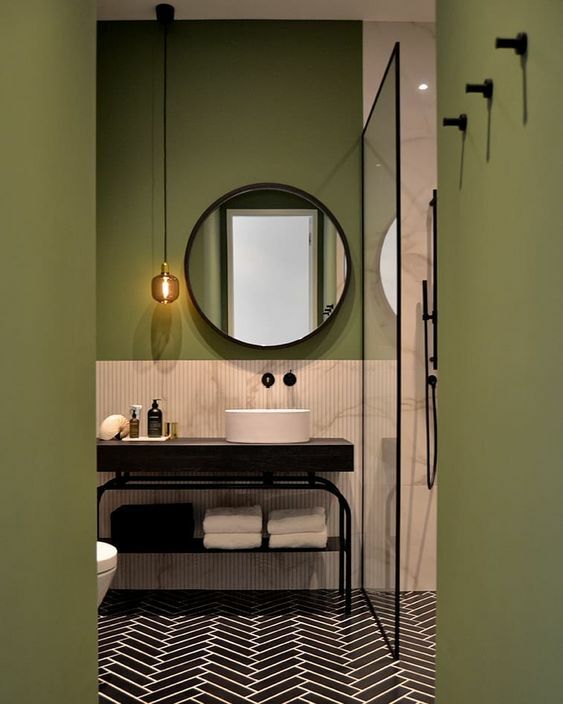 This green tiles on the shower area gives a dark and strong impression while it is combined with neutral marble on the toilet and vanity area. These two areas gives simple yet bold look. 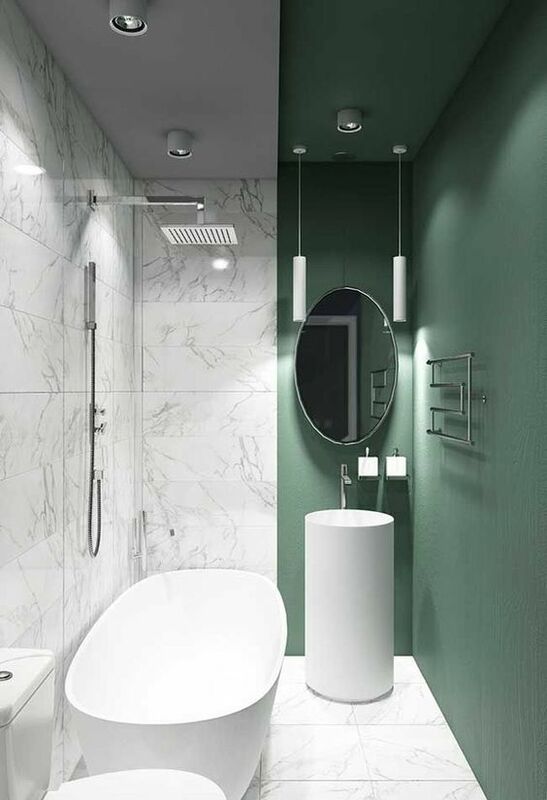 This one combines dark green painted wall with the neutral shower area with white marble floor and tub. 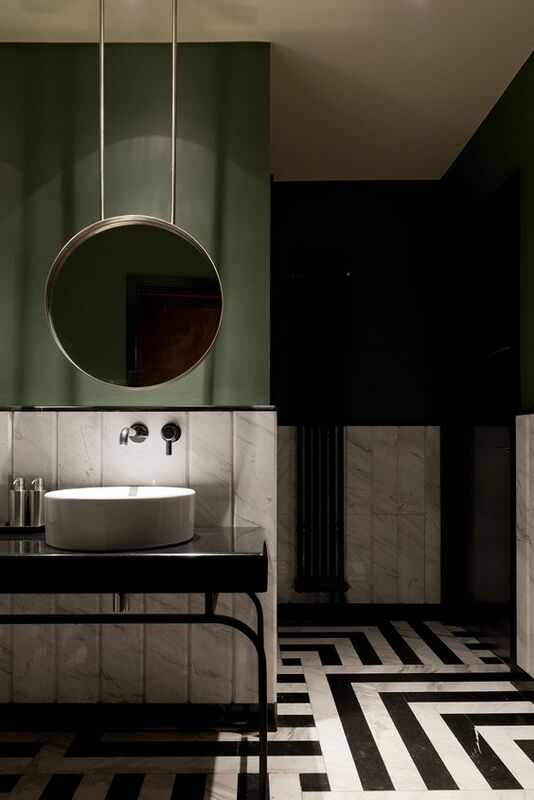 The geometric floor tiles puts a modern vibe to the bathroom that blends well with the dark green wall. 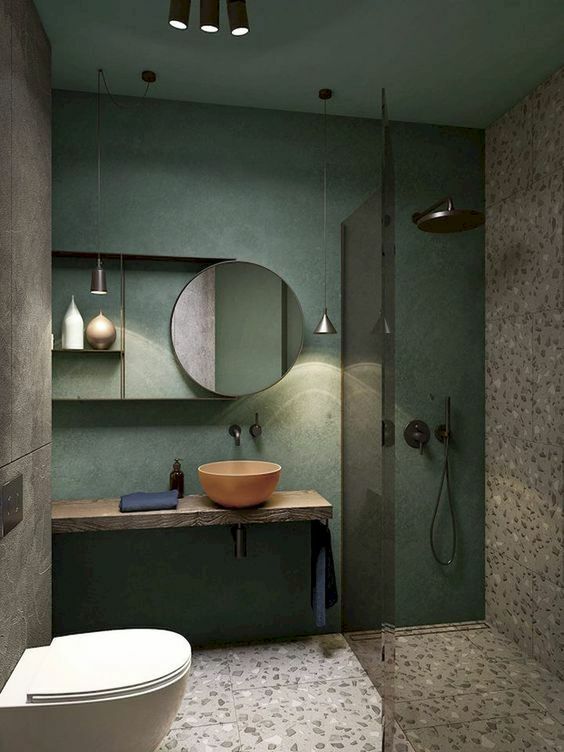 This one here shows a neutral yet interesting look with grey terrazzo tiles on the wall and floor and the dark green wall and ceiling. The clean and lean lines on the vanity makes an attractive finish to the bathroom. 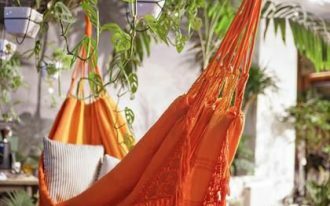 It is a perfect choice for you who love modern style in green. 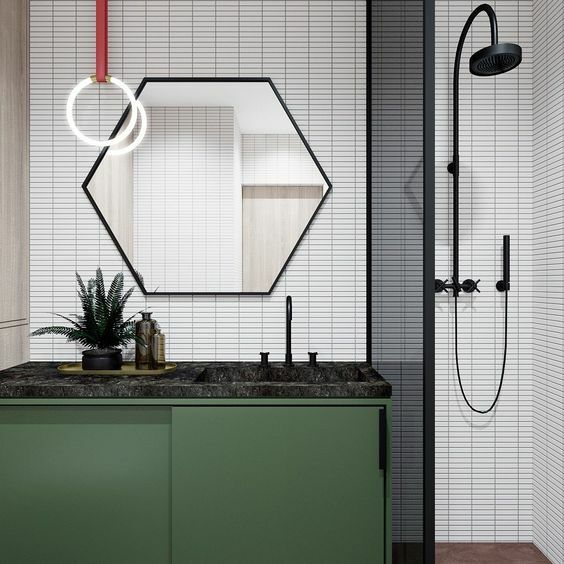 This modern bathroom with white wall tiles looks so endearing combined with the black lines on the mirror, shower, partition, and cabinet top. 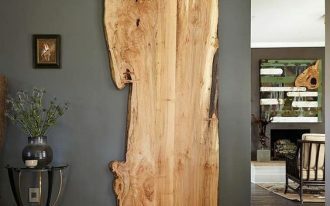 The dark cabinet brings more color but without making it too bright and bold. 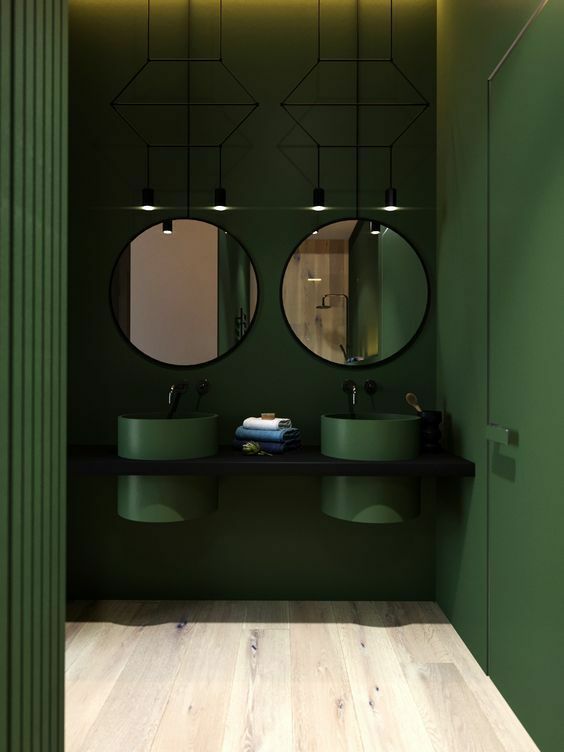 This bathroom is so interesting with dark green wall and sink. To make the room stays with the dark complexion, it is combined with black marble, black framed round mirror, and a unique black pendant. 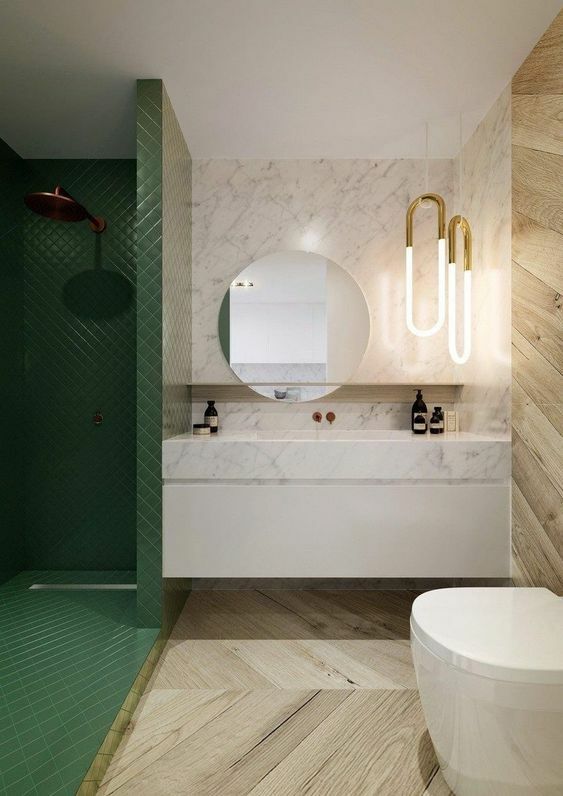 For those who love to get dark in green, this bathroom will answer your wish. This room also shows an interesting combination with half white marble and half dark green. Completed with white tub and sink, the room combines perfectly well in its unique way. 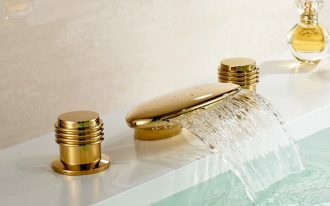 This dark green bathroom is empowered with its white tiles for bacsplash that continues to the other side of the wall. It is also strengthen with black white floor tiles with interesting lines. 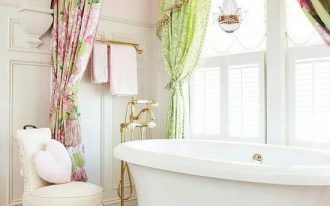 In this bathroom, the green color looks brighter than most of the green bathrooms here. 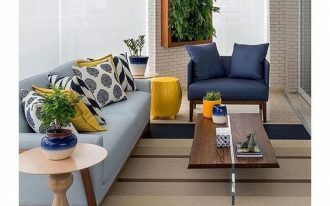 Combined with white tiles on the bottom of the wall, the room looks more cheerful. The mirror partition makes the room looks more spacious and gives the brighter effect with the double white tiles.